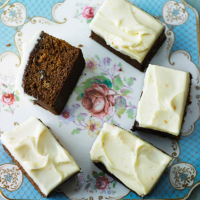 Fragrant orange zest, warming spices and molasses flavours from the brown sugar make this cake the perfect teatime treat. And as with all vegetable cakes, we always feel less guilty when going back for another piece. 1. Preheat the oven to 180 ̊C, gas mark 4. Grease and line a deep 20cm x 30cm baking tray with parchment paper; make sure that the paper comes 2-3cm above the sides of the tin. Toast the walnuts in the oven for 10 minutes; turn halfway. Cool, chop roughly and set aside. 2. Whisk together the oil, brown sugar and eggs until smooth. In a separate bowl, mix the flour, spices, bicarbonate of soda and salt, then beat into the wet mixture. Stir in the grated carrot, orange zest and chopped walnuts until well mixed. 3. Pour into the tin and bake for 30-35 minutes until golden and a skewer inserted into the centre comes out clean (cover the cake with foil if it starts to brown too quickly). Once cooked, leave in the tin for 5 minutes, then invert onto a wire rack and cool completely. 4. For the icing, use electric beaters to beat the butter and icing sugar together until light and fluffy. Add the soft cheese, mix for a few seconds, then beat in the orange zest and juice. Use a palette knife to spread over the cooled cake and serve.